Zombies And Toys: Indonesian Zombie : Real or Fake ? 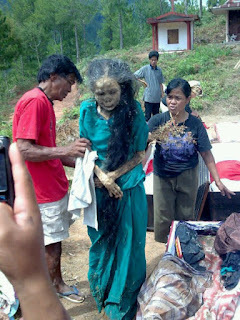 Indonesian Zombie : Real or Fake ? Matt Boiselle In what looks to one of the biggest internet controversies in a long time, the villagers of Toraja, Indonesia have reportedly allowed cameras to document what they are depicting as "a true zombie." The above picture was taken as a supposedly deceased female was being led to her new resting place. This is a long standing belief of the Toraja people, as death is purported to be a very long process. Funeral arrangements are extremely expensive, so the burial process is performed in kind of a two-act process. After death, the body is interred in a temporary burial spot while the family works to gain funds for a more decorated and celebrated funeral. Once the money has been gained, the Toraja believe that in some cases the dead are actually able to walk from their temporary to their final resting place. In the photo, you can see that the woman's arms are crossed, much like a person that had been prone in a casket, or that the head is slightly bent forward to suggest that there was a pillow under her head. Although these inferences are strictly "what ifs", the Toraja people stand by their beliefs and claim that this practice is nothing new. Others claim that this simply a case of leprosy, or that it has been photoshopped to extreme limits, but in my opinion ( of which is fairly useless), this just looks TOO creepy to pass off as fake. Check out the pics or click on the link to the website to read a little deeper into the story, however trying to get THAT face out of your memory banks may be a little hard to do ! What an interesting photo, and a story that begs further reading. Thank you for sharing!